Published: Dec. 2, 2018 at 04:13 p.m.
Chicago Bears running back Tarik Cohen burns a defender and catches for a 32-yard gain. Published: Dec. 2, 2018 at 01:44 p.m.
Chicago Bears quarterback Chase Daniel fools the defense with a 2-yard touchdown pass to tight end Adam Shaheen. Published: Nov. 22, 2018 at 03:10 p.m.
Chicago Bears running back Tarik Cohen beats his man and gets open in the end zone for a 14-yard touchdown. 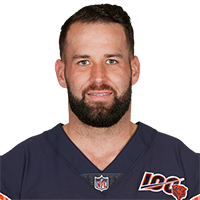 Published: Nov. 22, 2018 at 02:02 p.m.
Chicago Bears quarterback Chase Daniel lobs a pass to the end zone and running back Taquan Mizzell holds on for a 10-yard touchdown.